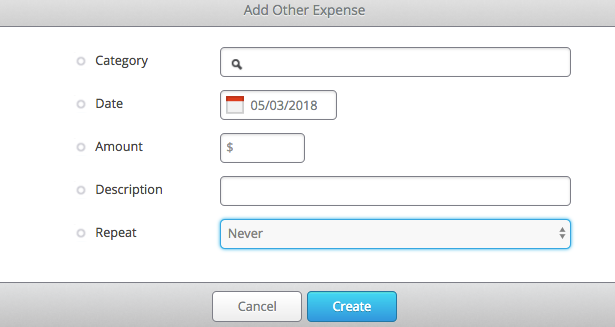 Often our users have expenses that recur every month that need to be entered into the other expenses screen. InventoryLab allows you to set expenses that you enter to be recurring on a weekly, monthly, or yearly basis. After clicking “Add” the following screen will appear. In this screen enter the category, date, amount, description, and repeat. The Repeat field is where you choose if the expense should never reoccur or if it should reoccur weekly, monthly, or yearly. You have different recurring options depending on which timeframe you choose. If you’d like the expense to repeat weekly, you’ll need to choose ‘Repeat every X weeks’ and which day(s) you would like the expense to Repeat on. If you choose to repeat monthly, you’ll need to choose the Repeat day (day of the month of day of the week), the day of the month or the day in the week that you’d like it to repeat (for example, every 3rd of the month or every 3rd Wednesday of the month), and Repeat every X months. For repeating yearly, you only need to choose the Day in year. Next, you can choose a Repeat end as Never, On a specific date, or After a set # of times. Once you click Create, the expense will appear and continue to reoccur according to the settings you chose. Clicking on the link will open the Add Other Expense prompt, allowing you to change the details. To manually delete transactions, click on the small box to the left of the transaction(s) you want to delete, click on the Action Button in the upper right corner of the page and select Delete. This will remove the transactions from Other Expenses.